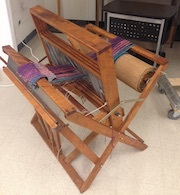 A loom is a device for making fabric by weaving yarn or thread. The Maker Hub's Dorset loom is manually operated, small enough to learn on, but large enough for complex projects. The Maker Hub also has a large supply of Yarn to use in projects. Keep an eye on the Maker Hub Calendar for our Introduction to the Dorset Loom Workshop.